The Catholic Commission for Justice and Peace (CCJP) under the auspices of Caritas Swaziland hosted the Bishop Zwane memorial lecture on the 29th April 2017, at the Our Lady of Assumption church in Manzini. 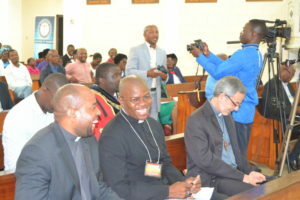 The memorial lecture was graced by circa 1200 guests, among them which included His Lordship Bishop Jose Luis Ponce de Leon of the Diocese of Manzini , Parish priests, Religious groups, the Mayor of Manzini, the family of the late Bishop Mandlenkhosi , Members of the Diplomatic Corp, The Council of Churches, the Press, Caritas staff, Congregants and the general public. The three hour lecture, which not only included great musical entertainment, but a keynote address on the late Bishop Zwane was delivered by Mr Maduduza Zwane, a member of the Zwane family, who related on the life, experiences, achievements and later the unexpected demise of the Bishop. It clearly stood out that the late Bishop was indeed a “MAN FOR ALL PEOPLE”, a true advocate for human rights and justice and peace, who tirelessly fought for the protection of human rights for all. He played several roles, including matters liturgical, enculturation, justice, international relations, communication and diplomatic dialogue with liberation movements, development of the siSwati language and its use in the Liturgy and economic initiatives to empower the poor. Among other speakers were His Lordship Bishop Jose, who gave the Welcome remarks and a short prayer service, Musa Dlamini the Programme Coordinator who gave a briefing of the Justice and peace commission, Melusi Matsenjwa the Programme director who also read a speech from the Council of churches in proxy of Rev A.B Thwala, as well as closing remarks by Fr Victor Mabuza the Chaplain of the Justice and Peace Commission.